Bred by Clermont Veilleux of Drummondville, Quebec and raced under the ownership of Ecuries Drummond Stables, Woodlawn Drummond made quite a mark for herself in the mid-1960s. In 47 career starts she posted 22 victories and earned $128,592. 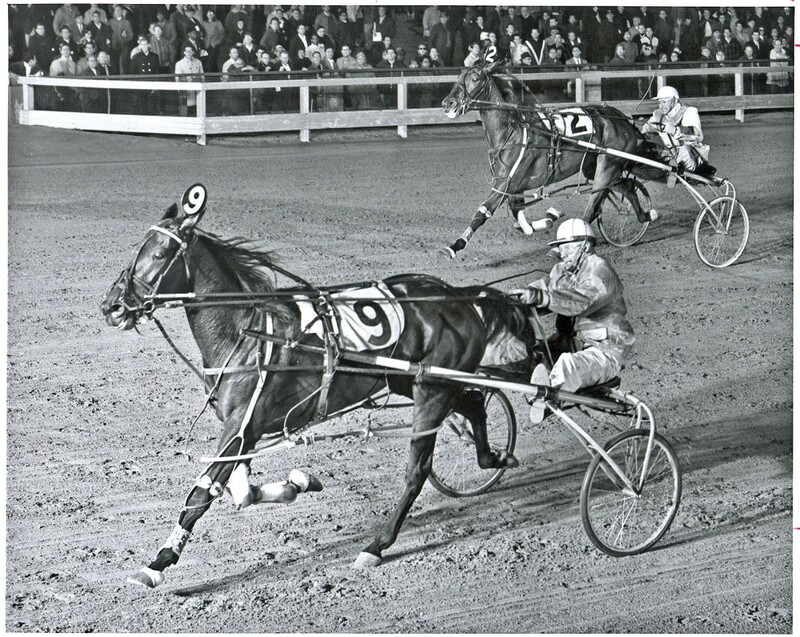 The bay pacing mare, driven throughout her career by CHRHF member Keith Waples, raced at tracks in Ontario, Quebec and New York State from the age of two through her four-year-old year, often competing against and defeating the best colts of the time. In 1964, at the age of two, she tallied a record of 8-0-0 in 14 starts, including wins in the Canadian Series Stakes at Greenwood Raceway, Connaught Park, Richelieu Park, where she set her two-year-old mark of 2:06, Trois-Rivieres and Quebec. The game mare’s best year on the track was as a three-year-old, when she twice defeated Balenzano who was later voted Harness Tracks of America’s Three-Year-Old Pacing Filly of the Year. It wasn’t just the fillies she dominated, as she also defeated colts Perfect Wave, Fleet Time, Keen Freight, Jerry Hal and Adios Watts on her way to record stats of 12-4-2 in 18 starts for earnings of $78,312 and a lifetime mark of 2:02.1 which she reached three times that year. Her year concluded with a win in the Lady Maud Stakes at Roosevelt Raceway and being voted the Canadian Trotting Association’s Three-Year-Old Pacer of the Year. Other stakes race wins at three included the Ladyship Stakes at Goshen, NY; La Quebecoise Stakes, Dottie’s Pick Stakes and Gaspe Futurity at Richelieu Park. Woodlawn Drummond concluded her racing career at the end of her four-year-old season after competing against the best older pacers in North America including Bret Hanover (five times), Adios Vic and Cardigan Bay. She managed a solid third place finish in Canada’s oldest harness stakes event, The Canadian Pacing Derby, at Greenwood Raceway, behind H A Meadowland and Timely Knight. Her year was highlighted by a win in the Canada Pace at Richelieu Park, and a second in the Ryan Memorial at Rideau Carleton for a record of 2-5-2 in 15 starts. As a broodmare her colts Keith Drummond, by Tar Heel and Gerry Drummond by Romeo Hanover saw some success at the track. Keith Drummond won 11 races for $44,029 in earnings and a lifetime mark of 2:01.4 set as a two-year-old. Gerry Drummond had 29 wins in his race career and set a mark of 2:04.4 at the age of eight.